After years of dominating the gaming market, things are looking bad for Nintendo. The past few months have been full of doom and gloom, with the delay of the new Zelda game the latest blow. Nintendo fans shouldn’t despair too much though, as Nintendo’s ideas always work out in the end. Here are some products that flopped at the time but predicted trends 10, 20 or even 30 years later. A cross between a NES controller and a medieval gauntlet, the Power Glove allowed kids to play games by inputting commands into an awkward keypad and occasionally wiggling their fingers. While it looked awesome, it flopped due to being nowhere near as fun as it should have been. Yet 20 years later, the Glove changed gaming as we know it…. The technology trend it predicted: Motion Control, as seen on the Nintendo Wii, Microsoft Kinect and Sony Move. The Power Glove is a natural precursor to the motion control trend. As it turned out, the missing ingredient was time; time for technology to catch up, and time for Nintendo’s designers to come up with something the average person wouldn’t feel stupid wearing. The next time you post a selfie on Instagram, spare a thought for the millions of kids who had to make do with a Game Boy Camera. This monstrosity was once the world’s smallest digital camera, producing hilariously low resolution images that could be printed out on a thermal printer. The technology trend it predicted: Camera phones and selfies. The Game Boy Camera was released in 1998, two years before the first camera phone hit shelves. It was also one of the world’s first front-facing cameras, a standard feature on modern smartphones. Unfortunately, Game Boy Camera selfies make you look like a ghost from a Japanese horror film but hey – it was a start. R.O.B – or Robotic Operating Buddy, as all robot names in the 80s had to be an acronym – looks like a cheap 80s toy, but it’s not: it’s actually another ridiculously complex controller. Having never had the opportunity to use R.O.B (the controller is hard to find this side of the pond), we still don’t quite understand how the controller works so we hate to think how hard it was to figure out in the 80s. Needless to say, R.O.B was a commercial flop although he lives on as a character in Super Smash Bros. The technology trend it predicted: Toy-themed video games like Skylanders, Nintendo Amiibo and Disney Infinity. 30 years after the demise of R.O.B, toys are the hottest trend in gaming. Franchises like Skylanders make millions from flogging figurines to kids, with each figurine unlocking a new characters. Perhaps R.O.B would have been successful if Nintendo took the confusing controller stuff out and made a whole robot family. Unlike most of the accessories in this post, the Virtual Boy is a pretty solid idea on paper: a standalone console/headset that allows you to play games in immersive VR. In reality, the Virtual Boy was a disaster. With Nintendo focusing their resources on the Nintendo 64, the Virtual Boy was rushed out in 1995 with a monochrome screen and a plastic design Fisher Price would be proud of. That’d be bad enough, but the Virtual Boy gave people headaches too. Throw in a tiny catalogue of games and it’s no surprise that Nintendo discontinued the Virtual Boy less than a year after its release. The technology trend it predicted: Virtual Reality headsets, like the Oculus Rift, Sony’s Project Morpheus and the HTC Vive. Fast forward 20 years and VR is all the rage. Although none of them have hit the market yet, we can’t wait to get their hands on the Rift, Morpheus or Vive. 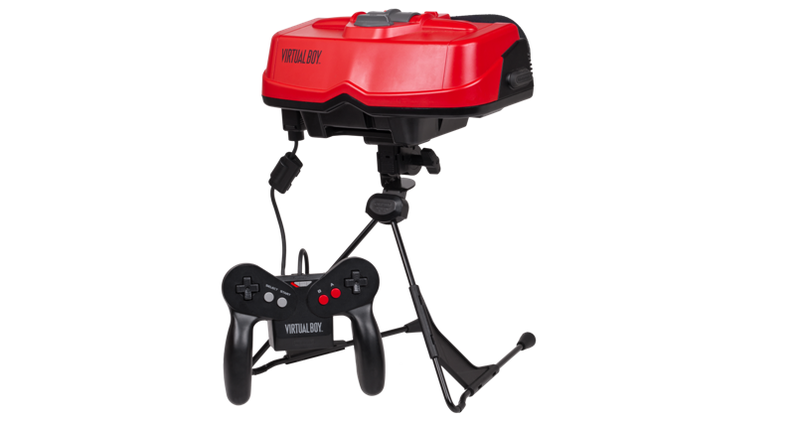 Nintendo didn’t come up with the concept of VR, of course, but the Virtual Boy was one of the first VR products released to the general public by a major company. As always, Nintendo had the right idea at the wrong time. Did you own any of the accessories in this post? Share your stories with us in the comments! Or, if you need to make a bit of space and cash, sell your Nintendo games consoles with musicMagpie! Have you played the weirdest games ever?